I wrote previously about the Standing Desk I use in my cube at work. Recently, I decided that it was working so well for me that I wanted one at home, too. At home, I didn’t have a cubical I had to work with, so I went for a different design. I wanted something adjustable so I could get the height exactly right, but I didn’t care about being able to adjust it on the fly (once I got the right height I knew I wouldn’t care about sitting down at it or anything). I didn’t want to spend a lot of money on it. Like last time I went to the Container Store. Not because I like them a lot better than Ikea, but because the closest container store is 5 miles from my house, and the closest Ikea is 25 miles. So it’s effectively 2 sets of InterMetro shelves sharing a common middle pair of supports with two shelves each. 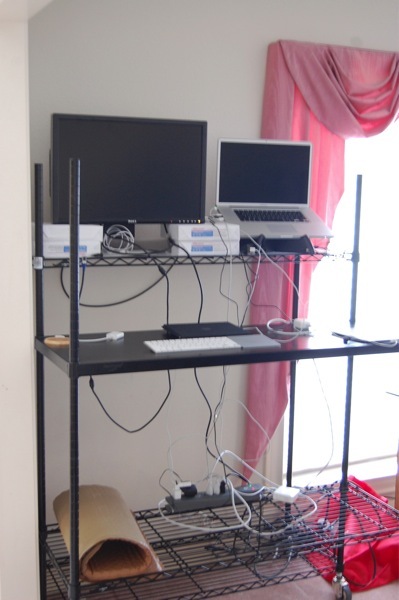 I put the solid shelf at keyboard height (where my elbow is at a right angle and my forearm is parallel to the floor) on the front set of four posts, and a shelf on the back set of 4 posts at the right height so the middle of my monitor is at eye level. Then I put one shelf at the bottom of the back set for stability, and a “foot rest” shelf on the front set positioned so that, when I rest one of my feet on it, my thigh is parallel to the floor. I end up resting one or the other of my feet on it fairly often. It seems to reduce fatigue to change positions frequently. I got another of the Gel Mats that I didn’t count in my $200 budget, but I recommend anyway.